A type of hinge where one flap has a long tail to extend across the door. Ideal on ledge doors where the tail can extend across the door construction for added strength. There are different weights from light to heavy patterns known as Weighty Scotch Tee Hinges. The image above shows a light black japanned tee hinge and a heavy galvanised tee hinge. Tee hinges are commonly used to hang garden gates and shed doors and are sold in pairs. 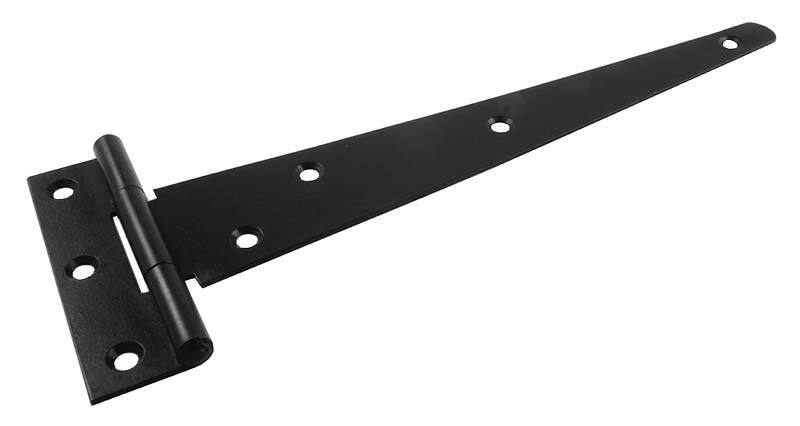 More decorative black iron versions of these hinges can be found and these are often used to hang doors inside the home where style and decoration is an important requirement. When fitting to outside gates and doors a galvanised version would be most suitable as these offer additional protection from the weather. The size of the hinge needed would be dependant on the size and weight of the door to be hung and we offer some guidance and advise on the following page; Hinges Around The Home. For light doors and gates a pair of hinges might be sufficient, for heavier doors fitting 3 hinges would be more beneficial. Tee hinges are measured from the knuckle along the length of the strap and this measurement does not include the hanging leaf. When selecting suitable screws you may require a longer length screw for the hanging leaf of the hinge which is fitted to the frame and a shorter length screw for the strap of the hinge which is fitted to the face of the gate or door.